Andrew Roberts addresses an audience at breakfast. 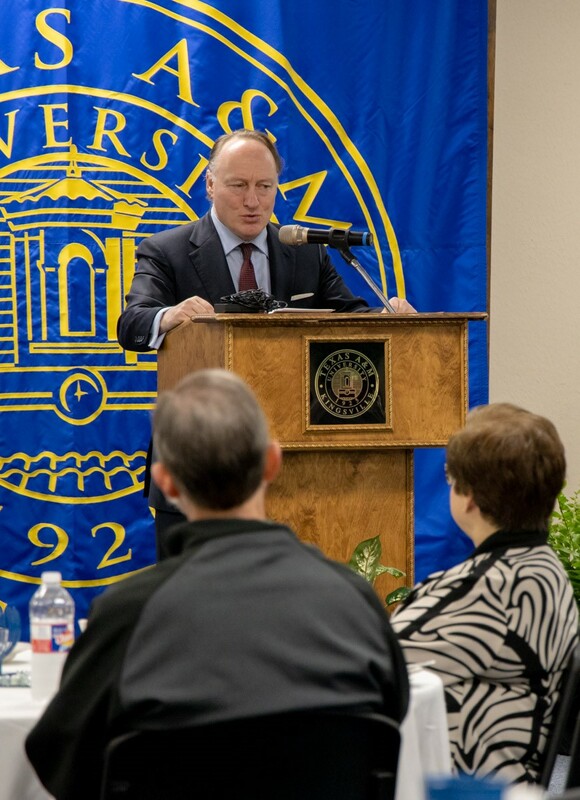 KINGSVILLE (April 15, 2019) — The Javelina Nation at Texas A&M University-Kingsville hosted distinguished author and historian Andrew Roberts for several events today, Friday, April 12. He has written what has been called the definitive book on Winston Churchill. He started the day early at Eggs and Issues where he talked about his New York Times Best-Selling Churchill: Walking with Destiny. Eggs and Issues is co-sponsored by the university and the Kingsville Chamber of Commerce. Roberts answered guests’ questions and signed copies of his book. After breakfast, he talked to history and political science students about Churchill and his accomplishments and failures. Roberts then took part in a question and answer session during lunch with members of the Kingsville community and university faculty and staff. Roberts, who was born in 1963, took a first class honors degree in Modern History at Gonville and Caius College, Cambridge, from where he is an honorary senior scholar and a Doctor of Philosophy. He is presently a visiting professor at the War Studies Department at King’s College, London and the Lehrman Institute Lecturer at the New-York Historical Society. He has written or edited 19 books, which have been translated into 22 languages, and he appears regularly on radio and television around the world. In 2011, NBC commissioned Roberts to commentate alongside Meredith Viera on the Royal Wedding of Prince William to Kate Middleton, following his well-received broadcasts at the funerals of Diana, Princess of Wales and Queen Elizabeth the Queen Mother, and the wedding of Prince Charles to the Duchess of Cornwall.